EX-OFFICIO STATE PROJECT DIRECTOR, SARVA SHIKSHA ABHIYAN. Sub: TSSA Hyderabad - Planning & MIS - Re-engaging of Cluster Resource Persons - Permission - Accorded - Reg. Vide reference cited, all the District Educational Officers were informed to disengage the services of Cluster Resource Persons from 20.04.2017 and to re-engage the CRP5 from 01.062017. Sub:- SSA, Mahabubabad - Re-engaging the services of MIS Coordinators, Data Entry Operators, Cluster Resource Persons, Messengers, System Analysts and APOs on Outsourcing/ Contract basis working at different levels in the TSSA during 2017-18 - Orders Issued - Reg. Ref:- 1. Proc.Rc.No.646/TSSA/Plg/T7/14, Dt: 22.04.2017 of the Commissioner & Director of School Education & Ex. Officio State Project Director, TS, Hyderabad. 2. Declaration of summer vacation vide Rc.No.843/Plg-1/DSE/2017, Dt:19.04.2017. 3. Proc.Rc.No.646/TSSA/Plg/T7/14, Dt: 19.04.2017 of the Commissioner & Director of School Education & Ex. Officio State Project Director, TS, Hyderabad. All the Mandal Educational Officers and Headmasters of High schools and school complex Secretaries in the district are hereby informed that in the references cited, the Commissioner & Director of School Education & Ex. Officio State Project Director, Telangana, Hyderabad has informed that the services of Part time instructors, Cluster Resource Persons, MIS Coordinators, Data Entry Operators, Messengers, System Analysts, DLMTs and APOs engaged on Outsourcing/ Contract basis during 2016-17 ceases by 20.04.2017 as per the references 1st & 2nd cited and instructed to review the performance of MIS Coordinators, Data Entry Operators, Cluster Resource Persons, Messengers, System Analysts and APOs working at MRCs and DPOs during 2016-17 and re-engage them from 22.04.2017 i.e., one day gap. With regard to Cluster Resource Persons working at school complex they may be discontinued from 20.04.2017 and re-engaged w.e.f., 01.06.2017 only after reviewing their performance with approval of the District Collector and Chairperson, SSA. 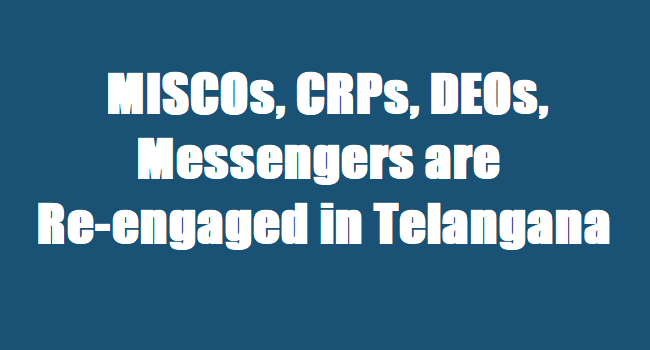 In view of the above, the services of Part time Instructors, Cluster Resource Persons, MIS Coordinators, Data Entry Operators, Messengers, System Analysts, DLMTs and APOs engaged on Outsourcing/ Contract basis during 2016-17 ceased by 20.04.2017 and the Mandal Educational Officers are requested to review the performance of MIS Coordinators, Data Entry Operators, Messengers working at MRCs during the year 2016-17 and re-engage them from 22.04.2017 i.e., one day gap and submit the compliance report immediately. Action should be taken accordingly. The receipt of these Proc shall be acknowledged forthwith. All the Project Officers of TSSA in the staM are aware that the services of Cluster Resource Persons, MIS Coordinators, Data Entry Operators and Messengers engaged during the year 2015-16 ceases by 23.04.2016 as per the reference cited above. Therefore, the Project Officers are requested t,o take necessary action accordingly. This has got the approval of State Project Director, TSSA, Hyderabad.